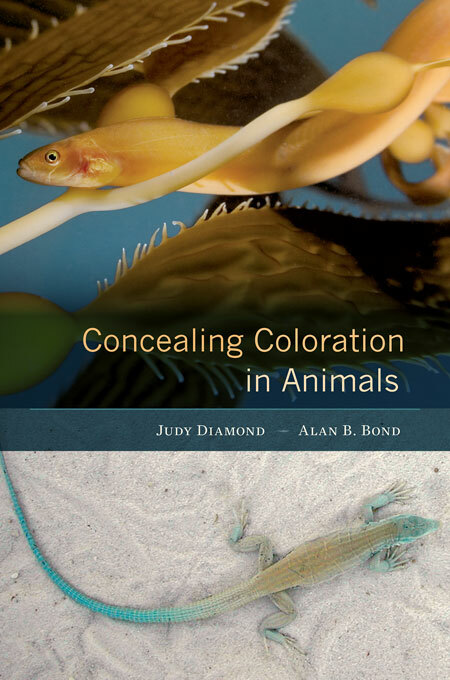 "Concealing Coloration in Animals" is a new book written by UNL's Judy Diamond and Alan Bond. A magical cloak of invisibility exists in the fictional world of Harry Potter. But evolution came up with the next best thing — concealing coloration. An animal’s colors, spots and stripes represent more than just fanciful design. In nature, these attributes are often hallmarks of the ability to survive. In addition to attracting mates and diverting enemies, color patterns can also conceal animals from detection. This is an unusual biological adaptation not only to the visual features of the environment, but also to the perceptual and cognitive capabilities of other organisms. The biological functions of coloration in animals are the subject of "Concealing Coloration in Animals," a new book by UNL faculty Judy Diamond and Alan B. Bond. Diamond is a professor and curator of Informal Science Education for the University of Nebraska State Museum of Natural History; Bond is a research professor of biological sciences and co-director of the Center for Avian Cognition. "Concealing Coloration in Animals" explores the many factors at work in the evolution of color patterns in the wild. The book features a variety of creatures, including those that live inside mats of floating seaweed, mice and lizards on desert rocks and sand, and rare parrots in the rainforests of New Zealand. The publication includes color photographs that show the wide array of deceptive strategies animals use to blend in, mislead or vanish from view. For more information, go to http://go.unl.edu/thy.